Village Weavers prefer hexose over sucrose sugar when offered dilute solutions. Interestingly, the weavers were able to maintain body mass on low concentrations, and met daily energy requirements, over a day. The authors suggest this could be a result of relatively slow transit times, allowing for better absorption at low concentrations. Abstract. Recent research has shown that nectar properties of flowers pollinated by generalist avian nectarivores differ markedly from those of flowers pollinated by specialist avian nectarivores. In particular, flowers pollinated by generalist avian nectarivores tend to have very dilute nectar dominated by hexose sugars. 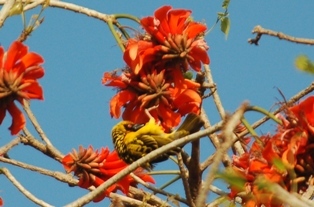 To establish whether pollinator-mediated selection can explain these traits, we tested nectar sugar preferences and digestive capabilities of the village weaver (Ploceus cucullatus), a common generalist passerine nectarivore in South Africa. When offered pairwise choices of equicaloric hexose and sucrose solutions, village weavers preferred hexose solutions at 5% and 10% sucrose equivalents (SE) but did not show significant preference for either type of sugar when higher concentrations were offered (15%, 20% and 25% SE). Birds were less efficient at absorbing sucrose than hexose sugars, as revealed by high-performance liquid chromatography (HPLC) analysis of excreta sugar content. This was true at both concentrations tested (8.22% and 25%), although apparent sucrose assimilation rates were still relatively high (89.6+-2.9% at low concentrations and 93.6+-1.7% at high concentrations). Transit times indicated that sucrose also passes through the digestive tract faster than hexose sugars, particularly when consumed at high concentrations. This may limit the rate at which sucrose can be hydrolyzed before absorption. These results indicate that hexose preferences in generalist avian nectarivores may help explain the low sucrose content in flowers pollinated by these birds. Moreover, the preference for hexose sugars in weavers was most evident at the low concentrations (ca. 9% sugar by mass) that are typical of nectar in flowers pollinated by generalist avian nectarivores.